It’s important to stay organized when you are planning a wedding. This tutorial walks you through how to make a DIY wedding binder. 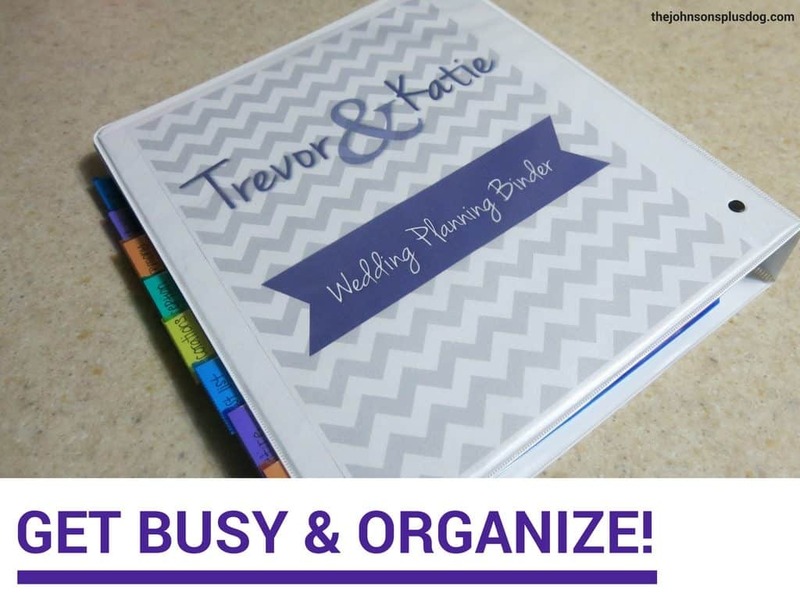 Making your own DIY wedding binder allows you to save money, organize your wedding ideas and customize it for whatever you need while you’re wedding planning. You may remember long ago when I wrote a post about wedding binder organization. I gave you some of my favorite tips on how to set up that DIY wedding binder of yours, but I didn’t have any pictures of my DIY wedding binder as an example. Today I have a real-life example to show you how to make a DIY wedding binder. My mom asked me to put together a DIY wedding binder for a family member as a Christmas present and I’m just getting around to showing you how to make a DIY wedding binder 😉 ! If you JUST got engaged, you’re ahead of the game! Start here by reading my engagement advice. 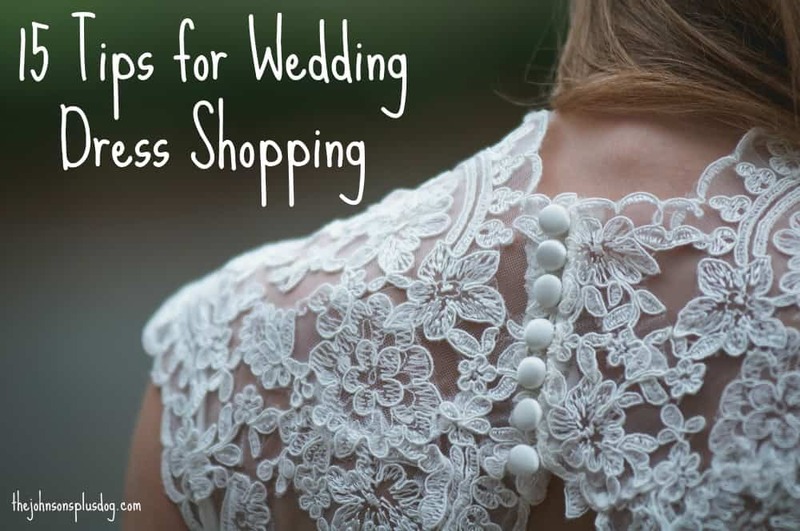 It’s important that you take a deep breath and go into the season of wedding planning with a clear head because sometimes it can feel overwhelming. When I am overwhelmed, I crave organization so I knew I needed a wedding planning binder. 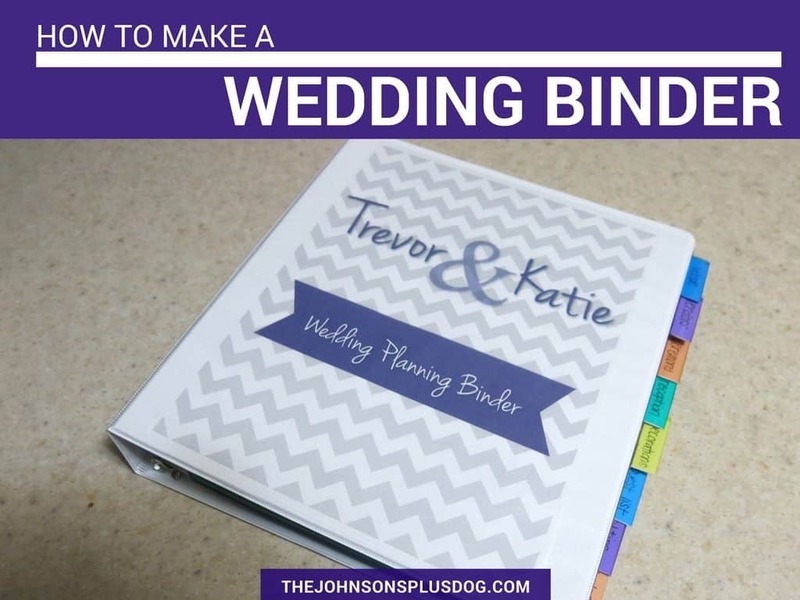 You may start the wedding planning process and wonder if you really need a wedding binder, especially since you have all of your idea cataloged on Pinterest anyway. I talked about the difference between Pinterest and your wedding binder here. In short, Pinterest should be a place of wedding inspiration and ideas. 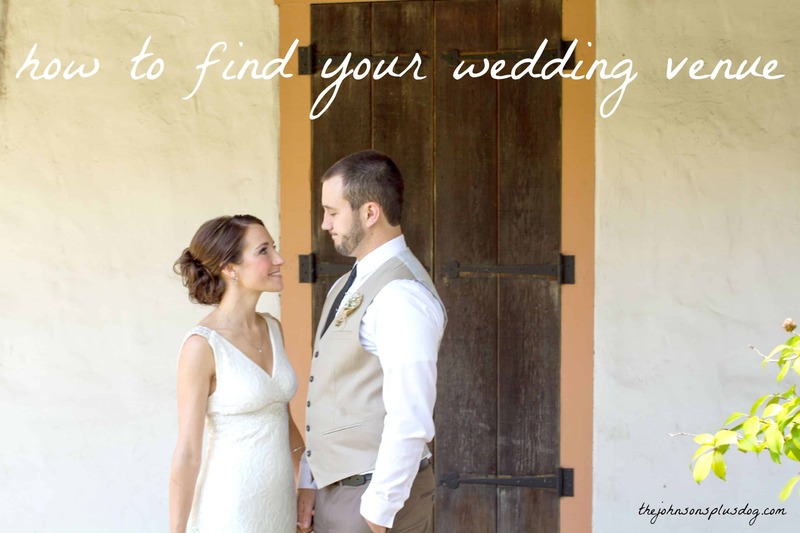 Your DIY wedding binder or files should be your place of organization and action. This DIY wedding binder post contains affiliate links, but nothing that I wouldn’t wholeheartedly recommend anyway! Read my full disclosure here. Dividers – even better if you can find some with pockets like these! 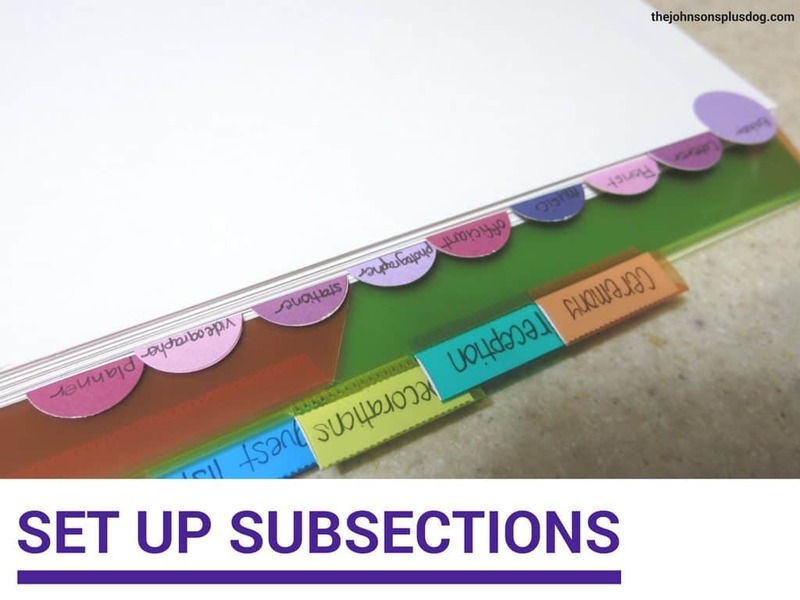 Or for DIY dividers (like I used in the subsections below), you’ll need: colorful card stock, white card stock, circle punch and pen/marker. In the front of the wedding binder, I like to keep the items that you will reference the most. 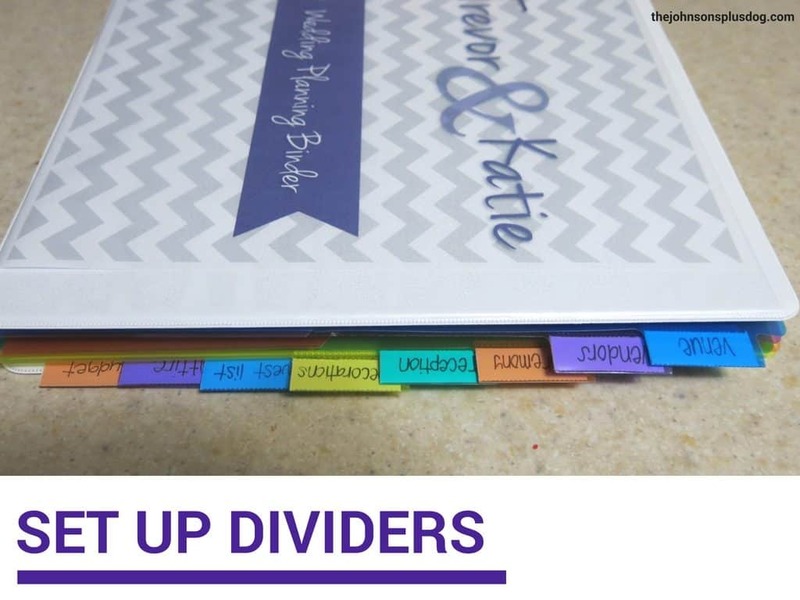 I made these fun and easy DIY dividers for the subsections. All you do is use your circle punch and punch out two circles for each divider, write your divider name and glue around (to the front and back of the paper) a piece of white card stock. Simple, right?! One of the most important parts of your whole binder is the calendar (in my opinion). Wedding planning is a busy season in your life and your calendar can get filled up, so be sure you write down all those vendor appointments, fittings, shower dates, etc. 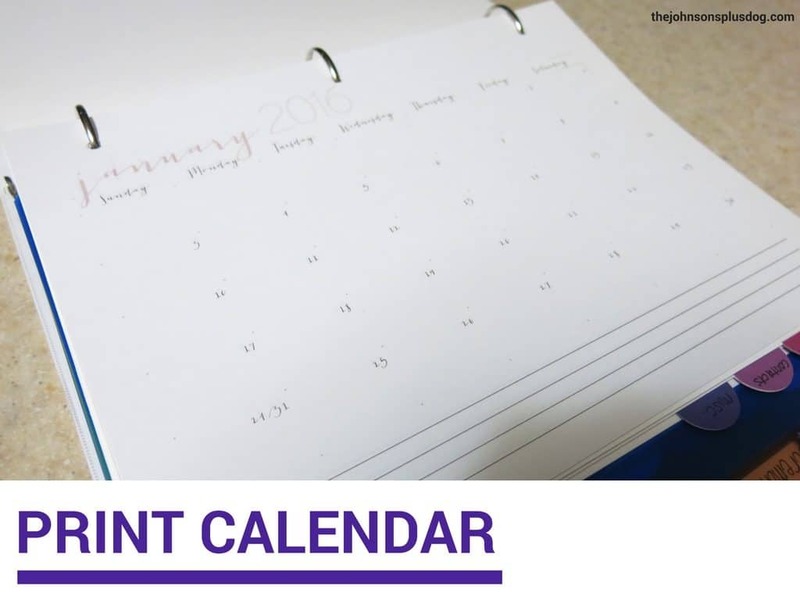 I love the printable calendar from Gloria Joy here (she also has some great other wedding binder printables and advice). 2nd most important item in your binder is your checklist. 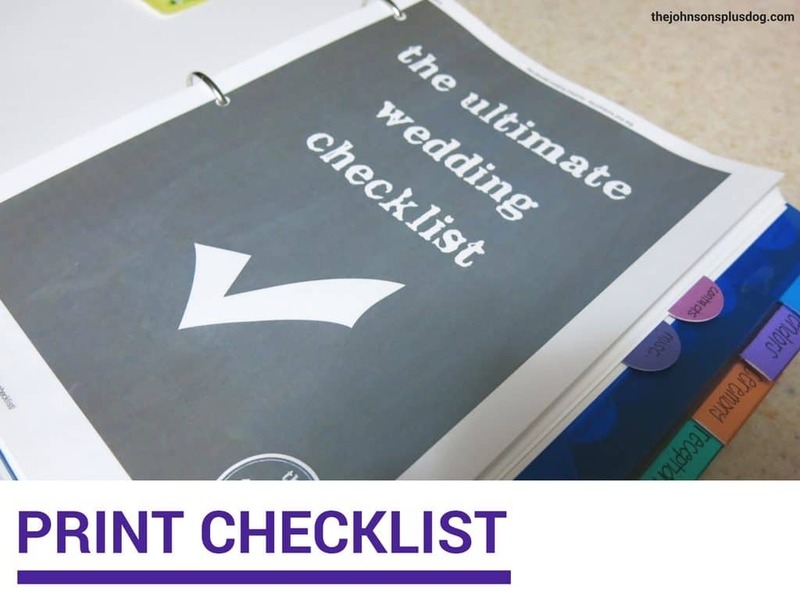 Click here to access my Ultimate Wedding Checklist, which has everything from when you say “yes” to when you finally say “I do”. For this wedding binder we used: venue, vendors, ceremony, reception, decorations, guest list, attire and budget. Other good divider ideas may be: transportation, honeymoon, travel, lodging/accommodations, music, rehearsal dinner, timeline/schedule, seating, etc. You don’t have to use subsections in your DIY wedding binder, but there may be certain sections that require a little more breaking down. In our case, it was our vendor section. I wanted to have a separate subsection for each type of vendor. Then you can hold important documents like vendor contracts and correspondence for each vendor there. I created subsections for the following types of vendors: baker, caterer, florist, music/DJ, officiant, photographer, stationer, videographer and planner. Additional vendors may be: hotel room blocks, jeweler, bar services, photo booth, linens, rentals, tent, lighting, security, transportation, entertainment, etc. You will want to have plenty of paper to jot down notes during meetings and phone calls. 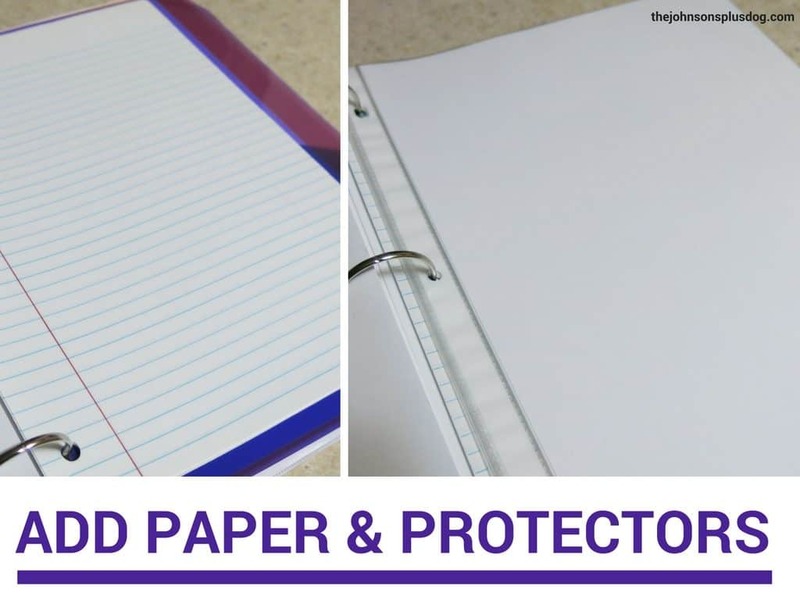 The page protectors are great to hold papers without holes punched, business cards, brochures, magazine clippings, etc. 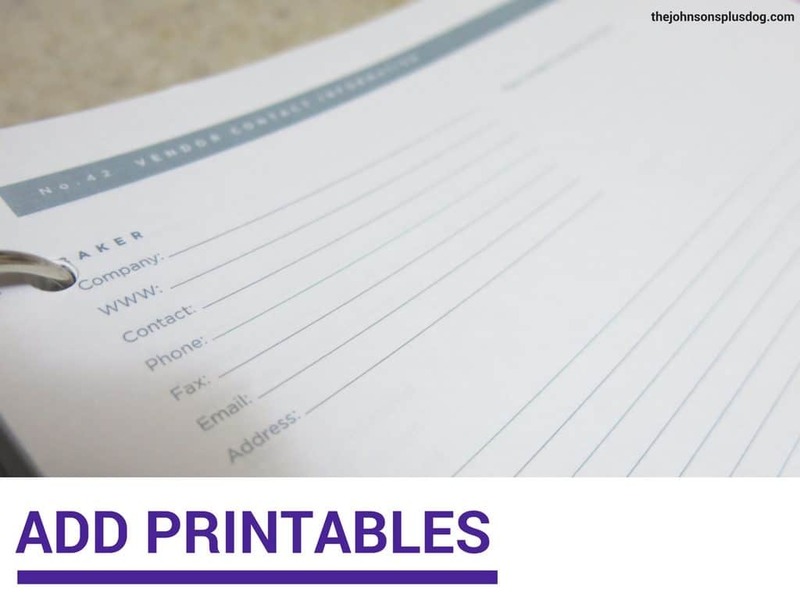 I printed out some of my favorite blog posts for this binder like: 15 Tips for Wedding Dress Shopping for “Attire” section, How To Find Your Wedding Venue for the “Venue” section and How To Start Your Wedding Guest List for the “Guest List” section. It may be helpful to print out some infographics as well, like this one: Guest List in 30 Seconds. 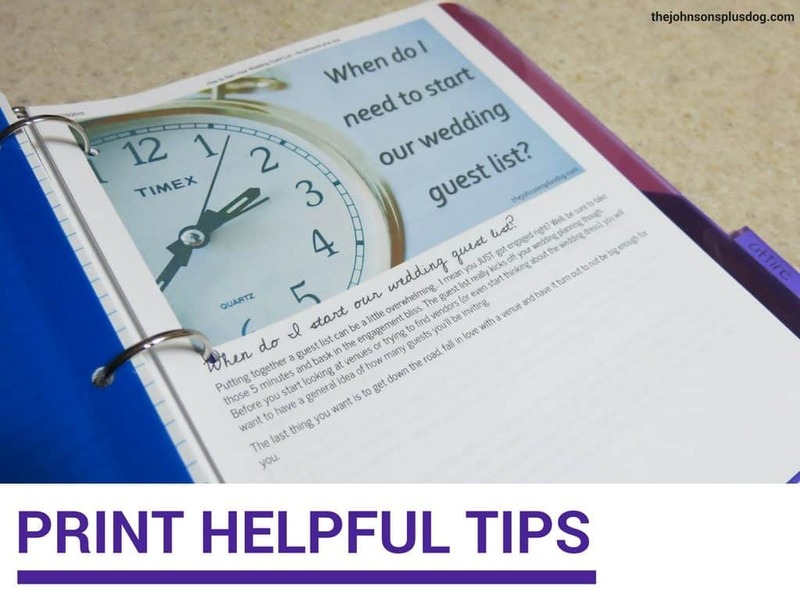 Whatever you choose to print, be sure to fill your DIY wedding binder with lots of helpful tips so it’s your one stop shop. 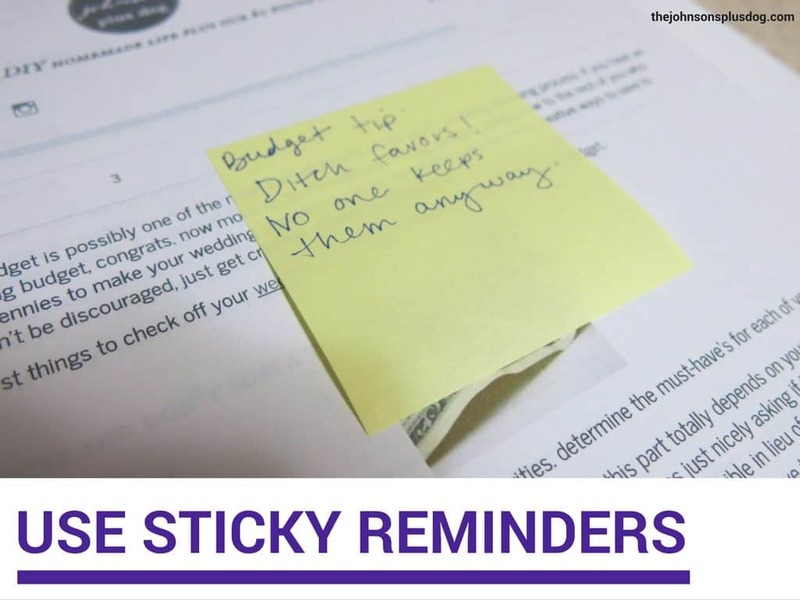 Since I was making this wedding binder for a bride-to-be, I used sticky notes throughout to give her my little tidbits of advice (like the one above: Ditch favors! No one keeps them anyway). However, when I was getting married I used a lot of sticky notes throughout my wedding binder for little reminders to myself. 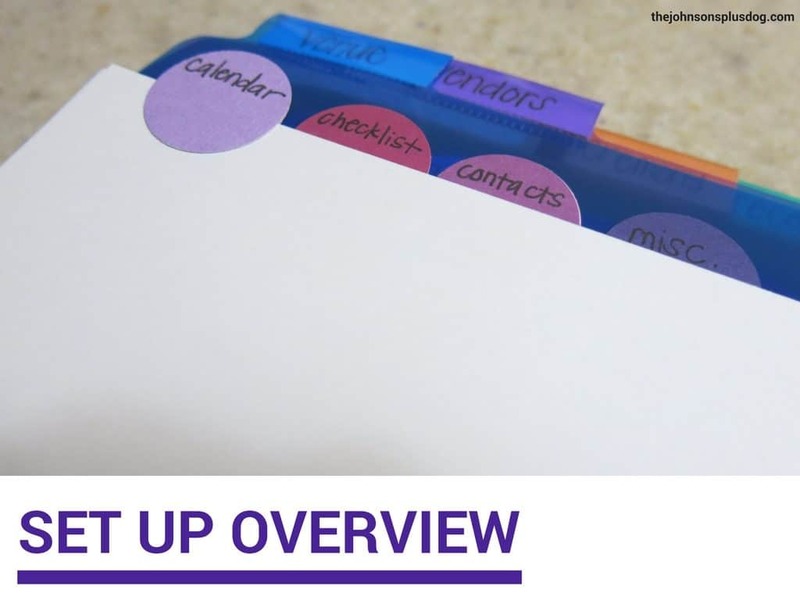 Step Ten: Get Busy & Organized! That’s it folks! Now get out there and organize! Don’t forget to continue to check back on the Ultimate Wedding Checklist as I post more wedding planning goodness, or subscribe to the blog (below) to get updates as they happen! Where did you get the subsections? Did you buy them or did you DIY them? I made the fun and easy DIY dividers for the subsections. All you do is use a circle punch and punch out two circles for each divider, write your divider name and glue around (to the front and back of the paper) a piece of white card stock. Simple, right? !